Hello. I'm Mark Bosworth. I was born and raised in NE Portland, was educated at Hunter college in NYC, and I've spent most of my professional career working for Metro, the regional planning organization as a Geographic Information Systems (GIS) specialist. I'm 53 years old. I'm a husband to Julie, father to two young women, Kelly and Claire, hero to my dog, Biscuit, and I count scores of friends from here in Portland, and around the world. I am all kinds of other stuff too of course: I'm a musician (a singer and guitar player); a dedicated bike rider (year round commuter and fairly serious recreational rider); an accomplished cook; kind of foodie and kind of a transit geek. One thing I'm NOT is a cancer victim. 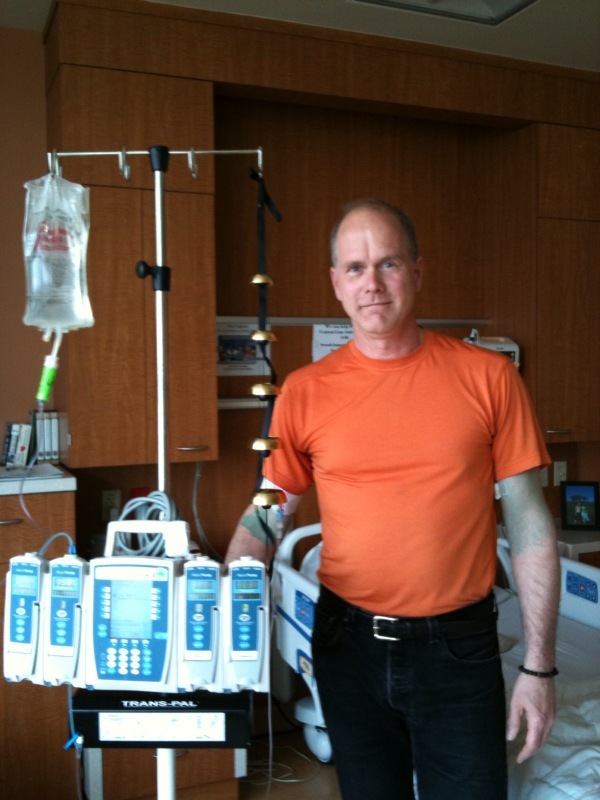 I hardly see myself as a cancer patient even - though the blue gown and the IV pole was working against me for awhile. And, now I'm completely bald, but at least that is chic these days. I am a happy, successful person. My doctors keep telling my I'm "young and healthy"! I consider myself a very lucky guy actually. I am undergoing treatment for Non-Hodgkin's Lymphoma. This is a recurrence of a previous condition. I was originally diagnosed in September of 2008. After many months of chemo-therapy I enjoyed almost two years of remission. My recurrence was fairly unusual - the symptoms manifested in my eyes only - so this occurrence is considered a central nervous system (CNS) relapse. (more gory details on request). The last 9 months I've been through a battery of tests and treatments. Including radiation and injections and high dose chemo-therapy. Recently, I completed a successful Bone Marrow Transplant (BMT) at Oregon Health Sciences University (OHSU). This is considered the best path to take to insure a good long term outcome for this disease. I am currently recovering at home - taking baby steps to build back my immune system and strength. I feel more and more "myself" everyday, and am contemplating my return to my normal activities soon. If you are viewing this page, you've probably been invited to follow this blog to keep track of my status through the next few months of treatment and recovery. Julie and I will be posting here to keep you informed and to let you know how the process is going. I invite you to contribute: comments, observations, quotes etc... just click on the little blue (COMMENTS) link at the bottom of each post.